I love Maxfield Parrish. He is and always has been one of my favorite illustrators and artists. I love his vibrant, saturated colors and the visual depth of his landscapes, his use of perspective and the playful humanistic qualities he gives to each of his subjects. I often think of him when the evening sky is awash with stark color after a storm. The blue is most likely a colbalt used often in Parrish’s work, and I loved this particular shade of his even before I knew it was a thing. It is a blue that says many things to me–of the variations of nature, of a kind of impishness, of the joy that being all-in with life can bring. 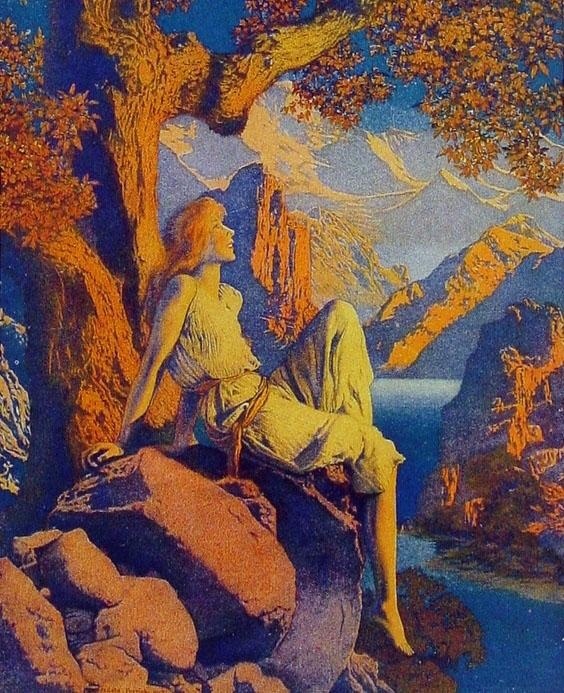 Maxfield Parrish’s art, because of its sheer volume, variation, and detail, also says to me he must have enjoyed the creation of it immensely. What a luscious life he must have lived, reveling in it. I think of Parrish in the context of a talk I attended just the other week, between a writer of some renown and an editor from a major publishing house. He was asked what advice he could give the attendant audience of writing students, especially when they’re feeling the full brunt of the pressure to publish. He said first and foremost to enjoy this early time in their career when the flush of discovery and learning is still fresh, and learn to cultivate it throughout your writing life. But more than anything, you need to enjoy the process, because if you don’t, it’ll show in your work and you’ll be doomed to ordinariness. And you’ll spend a whole lot of time being miserable. Fine advice to always keep running in the background, no matter what discipline you create your art in. Especially on a soft, summer Maxfield Parrish night as this.